Hello friends, it's been a while since I've done a Five on Friday post, and anything to do with crocheting. 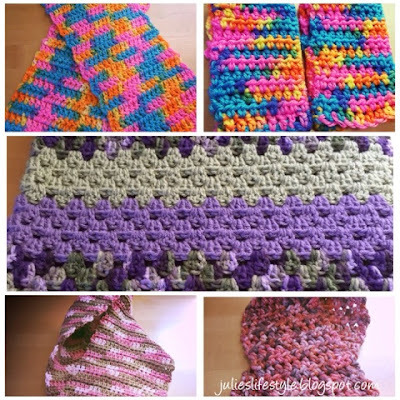 Today I'd love to share with you five different crochet projects I made over the winter. Below is everything I crocheted, and all stacked up! 1) I crocheted a lap blanket over the winter using three different skeins of yarn. 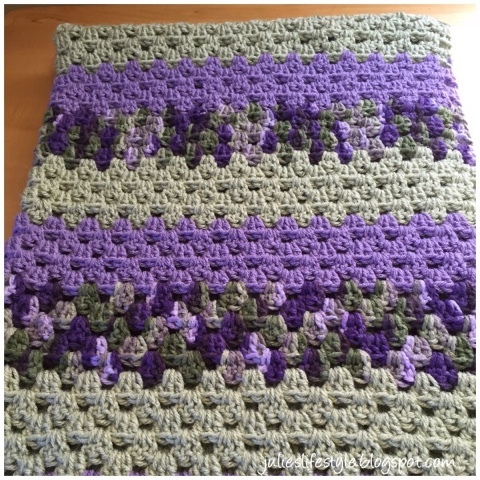 I made each section using light green, purple, and multi colored yarn, with each section using five rows. To see the details on how to make one, you can click HERE and HERE. 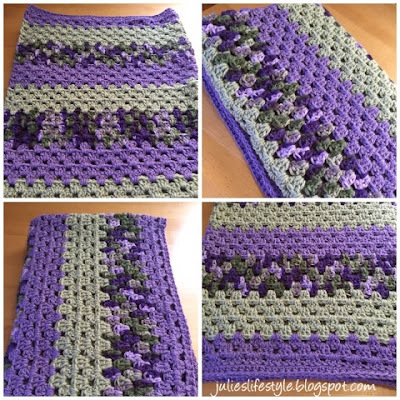 I enjoyed crocheting this blanket during the cold winter evenings, while I was watching TV. 2) Below, I made this crocheted scarf using Red Heart variegated yarn. 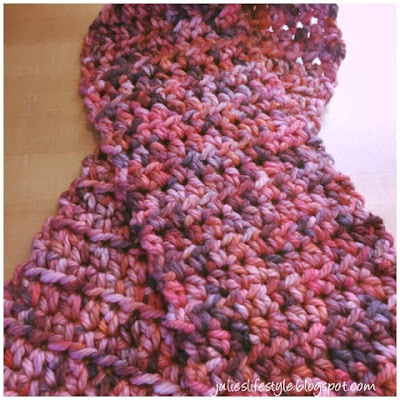 The yarn is mixed with light brown, light pink and a darker pink shade. The crochet hook is a US size I hook. I made this using the half double crochet stitch. 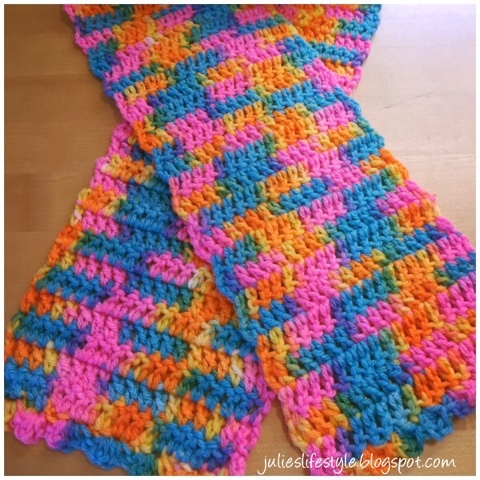 3) I crocheted the scarf below, using thick variegated, chunky yarn. I used a US size J or K hook. Using thick yarn and a large crochet hook works up fast, which I love. I used the half double crochet stitch for this scarf. This will keep someone very warm during the winter. 4) This is a bright colored scarf I made for a little girl to wear. The yarn is from Red Heart, and the crochet hook is a US size I. I made this using the double crochet stitch, and I made a scalloped edging on both ends of the scarf. 5) Finally, I made matching crocheted hand warmers to go with the scarf. To make these hand warmers, you can click HERE for pattern that I designed. Below you can see all of my crochet projects I made. All of this has kept me busy during the winter evenings. I also worked on everything each week, at my Tuesday crochet group meetings. I really enjoyed working on all of these crochet projects. I will also be donating it all to our holiday knit/crochet sale we have each fall at my church. 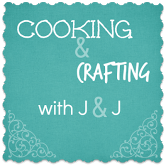 Don't forget to come back and stop by here on Monday for our 50th Cooking and Crafting with J & J Link Up Party!! You've been productive! So many pretty projects! Happy Friday Julie! You have certainly been busy, a great five. Loving the bright colours and yarn variety. I get stuck on 8 ply and need to motivate myself to add variety to my crochet. What lovely colours and finished projects! They turned out beautifully. 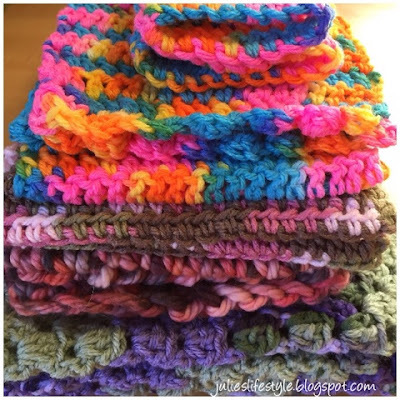 Have you ever thought of making some hats and blankets for your local NICU? We had people who made them for each baby that was in the NICU and I still have the two we received last year when my girls were there. So meaningful and heartfelt. You have been busy! What a colourful bunch of projects. I feel like picking up my hooks too to make something this big but that will have to wait because it gets too hot here to work with yarn during the summer months. You have been busy :-) Crocheting is just a wonderful way to pass the time. You have been busy! I don't crochet but I'm thinking I should learn. I love the purple one that's first on your post. Beautiful colours. I love all those colors, July. So pretty indeed.. It's so nice that you will be donating these projects, Julie! The recipients will be very happy to have them, I'm sure! I saw them on Instagram just now and came over to have a look! I love them all, but the lap blanket is my favorite. Those colors are gorgeous. My goodness you have been a busy bee Julie! I adore all of the color. Have a wonderful flower filled week! I love the variety of colors you've used, Julie. You are so talented! Thanks for sharing at Snickerdoodle Sunday. Pinned and Tweeted. So many pretty projects and colours, Julie! Wish I could crochet! You certainly spent your winter well creating these. Thank you for sharing and linking. Have a lovely day. 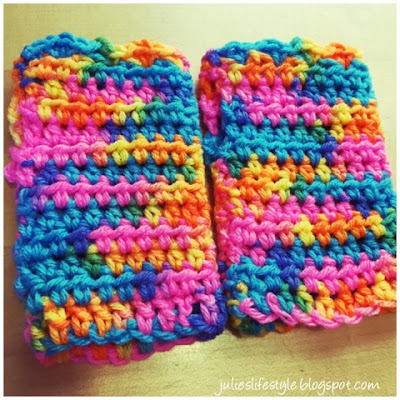 Love all your pretty crocheted projects, Julie! You sure keep yourself busy. The blanket turned out awesome! I'm still working on the granny square one. So pretty, every one! But I adore the purple lap blanket. The colors are so pretty! Thanks for linking it up to Dishing It! & Digging It! Such pretty projects! I love to crochet but don't make enough time for it. I really need to! Years ago, when my friends had babies, they would get a crocheted baby blanket from me. I need to make some more! I think Iike the bold colors of the first project right now. You've been busy! My favorite is #2, I love the colors of that scarf! Thank you so much for sharing all your lovely projects at The Really Crafty Link Party this week! Pinned! Julie you are so talented! These are lovely!I don't know which is my favorite. I tend to like bold and bright colors, so maybe those might be it :)I have a friend who wants to teach me to crochet and I am looking forward to that! 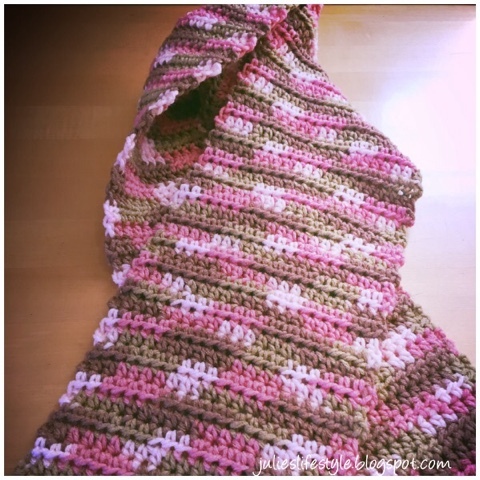 I always love seeing your finished projects :) You are such a great inspiration! Beautiful projects! I especially love the lap blanket! Great colors all around! Thank you for sharing with #FiberTuesday! You have been a very busy lady! They are all beautiful too. I love crocheted scarves. So glad you share with us at Merry Monday. Julie, you are so talented! Thank you for sharing your beautiful scarves @Vintage Charm!